The documentary covers what caused the gaming market to crash, and also the search for the “lost landfill” where Atari allegedly dumped millions of unsold games. Unlike the bigfoot shows they actually did find what they were looking for – a big heap of games – and many of them were recently put up for auction on eBay. Atari was a big part of my childhood and modding the consoles is what got me started in the maker community, so I felt obliged to own one of these trashy relics. Didn’t have to be ET, anything from that site was good enough for me. I went with Asteroids and Star Raiders (with keypad!) I actually quite like 2600 Asteroids. Back in the day the games were dumped, steamrolled and then covered with cement to stop looters. From the auction photos I could tell the cartridges were fairly intact inside their boxes, so I reasoned the PCBs were likely still intact. My goal was to obtain one of these cartridges and try to bring it back to life. To actually PLAY a landfill cartridge that had been buried for 31 years! A new-in-box Asteroids cartridge from the Atari landfill! 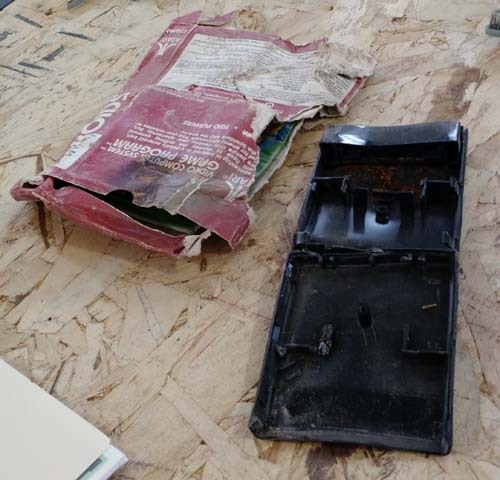 The games were shipped in Ziploc bags along with documentation, certificate of authentic garbage and a metal numbered tag. I was immediately surprised – for whatever reason – that they still smelled like a landfill. Not super good! 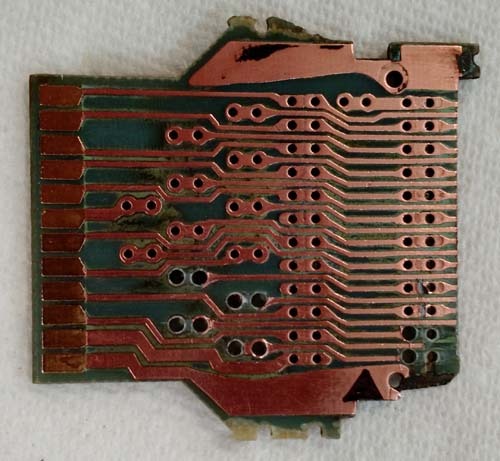 The PCB, after a some cleaning and removing the RF shield. 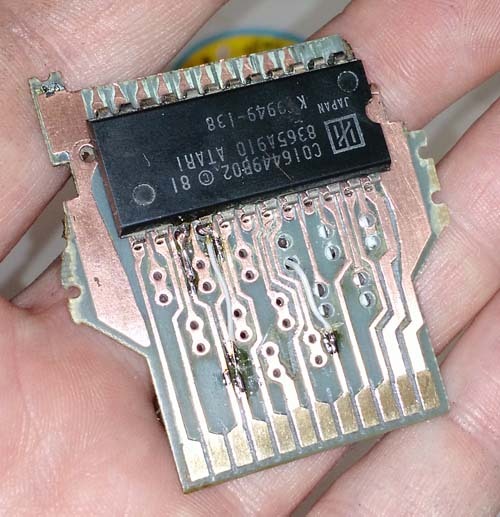 The PCB and ROM were intact, save for a chipped corner that probably was damaged when the plastic shell was crushed. There were no traces there so that’s fine. 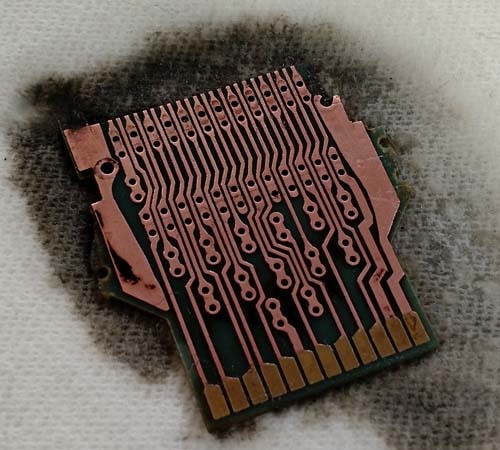 The real issue was corrosion – the PCB was quite black and the traces barely visible. We removed the ROM to get at the corrosion underneath. Below you can see what the entire PCB looked like. With 15 feet of rubbish above the Atari pile, who knows what trickled down through it? Steel wool, rubbing alcohol and elbow grease removed most of the corrosion. Almost no trace of the green soldermask remained.. Though covered in gunk the contact fingers at the end were smooth and pristine because technically, this is a *new* game. 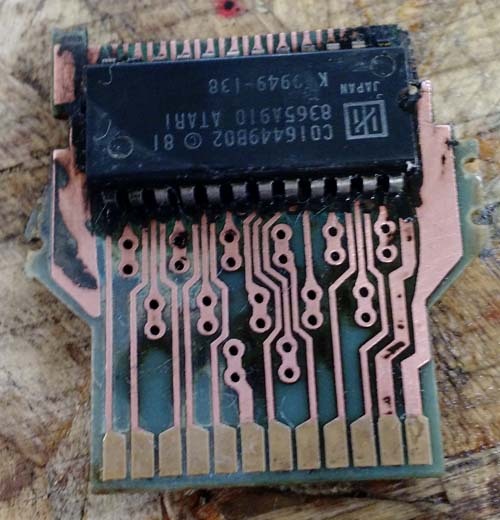 After the PCB was cleaned I started doing electrical tests. A few pairs of traces were dead shorted to each other, while a few more had 2-3k ohm resistance – still not good. At this point I could have simply stuck the ROM into a spare Atari cartridge PCB but I wanted to keep everything as original as possible. Grime, hacked traces and all! Some of the issue came from bad via’s. Via’s are the things that pass a signal from one side of the board to the other. Something had corroded them, causing short circuits. This can happen to PCB’s sitting a closet, to say nothing of sitting in the ground. 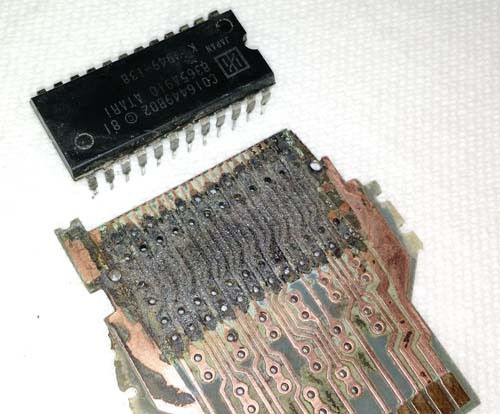 This is an ancient board and thus is only 2 layer (top and bottom) Thus, a via is only connected to the top and the bottom, unlike a modern PCB where there could be internal power or signal planes. This allows me to confidently drill out a via, breaking its signal and whatever is corrupting it, and replace the connection with a small bit of wire strung through the resulting hole. I also had to scrape out between the metal fingers quite a bit – even though it *looked* clean corrosion was still passing current. It could be compared to scraping invisible plaque off a tooth. In the photo below you can sort of see the scratches I made between the contact fingers. In total I bridged 7 connections – 4 on the back (not shown in photo) and 3 on the front. Some connections were worse than others (dead shorts versus 2k, 3k, 500k resistance) but to be on the safe side I fixed anything remotely fishy. Yuck. Fish guts could have leaked onto this thing. I still have crap in my fingernails. If I die of some since-cured disease you’ll know why. The ROM itself I was not concerned about. 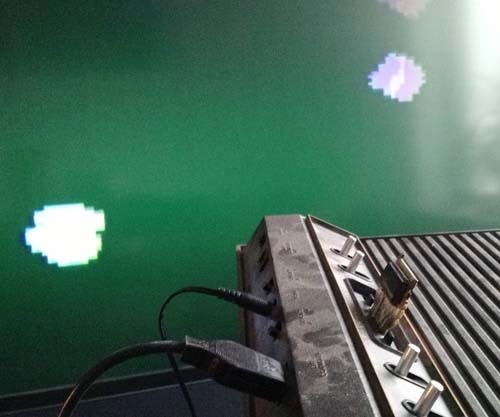 It’s a sealed package and as long as it wasn’t cracked and the pins were intact, I knew it would be OK.
With about 80% confidence I plugged Asteroids: Rise From Your Grave Edition into our break room Atari 2600 – and it worked! I then played several games of Asteroids. We documented the “unboxing” and surgery for the Ben Heck Show, stay tuned to Element14.com to see that episode in the future! It’s interesting to think of everything that has happened since these carts were buried. Most of my life, for one thing! Our show’s producer, Alyson, got to play a cartridge today that was buried before she was even born. There is some melancholy with this great find. They exhumed a bunch of stuff from a 10′ x 10′ hole – just scratching the surface of what 13 dump trucks could hold. See it wasn’t just ET carts buried, but all sorts of unsold games and rumor has it, game systems and prototypes. There could be Atari artifacts down there beyond our wildest aspiration but now that they’ve done the dig, it’s over. Only time and shovels will tell.